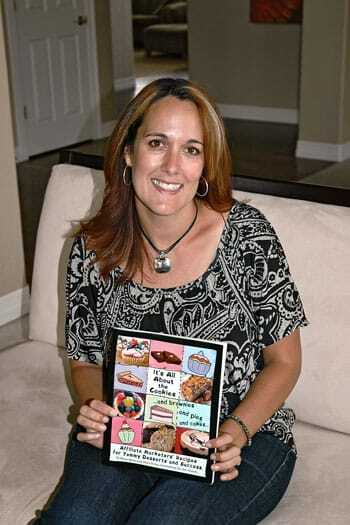 Castle Pines artist and entrepreneur Jennifer Goode, holding a coy of “It’s All About the Cookies,” a desserts-only cookbook being sold to raise money for breast cancer research. Goode designed the cover art for the book. It has been said that diners eat first with their eyes and then with their mouths. Castle Pines artist and businesswoman Jennifer Goode knows a little something about both. She recently designed the cover for a desserts-only cookbook called “It’s all About the Cookies . . . and brownies and pies and cakes . . .” But the book is more than just a resource for cooks looking to whip up something tasty to end a meal. A freelance designer and illustrator, whose signature design is a group of cartoon penguins, Goode uses Internet marketing to promote her products. She has joined forces with several other Internet entrepreneurs to cross-promote products and services in a practice known as affiliate marketing. This year, Goode joined forces with several of her fellow affiliate marketers to raise money for breast cancer research through sales of the cookbook. Most affiliates contributed recipes to the book, but Goode went a step further, designing and styling photos and drawings for the book’s cover. “Four years ago I walked in the Avon Walk for Breast Cancer, and I walked 60 miles in the Susan G. Komen 3-Day for the Cure walk as well. This year will be my fourth year to do the Race for the Cure here in Denver,” said Goode. Goode’s life has been touched by breast cancer -- her grandmother was successfully treated twice and her mother-in-law fought a battle with the illness last year. This month, Goode will do the Race for the Cure with her husband Dave, sons 16-year-old Zack and eight-year-old Jaret, and her daughter Lauren who is just four. “This project has been a great way to marry my personal life and my working life,” said Goode. All proceeds from sales of the cookbook will be donated to the Avon Walk for Breast Cancer. The book, published just a few months ago, has already raised more than $2,500. For more information about Jennifer Goode and her work, visit www. portfolio.jgoodedesigns.com. Preheat oven to 350 degrees. Melt butter in a 9x13 inch baking pan. Sprinkle crumbs over butter. Pour evaporated milk over crumbs. Layer nuts, chocolate chips and coconut evenly. Press down firmly. Bake for 25 minutes or until lightly brown. Cool and cut into bars. In a small saucepan over the campfire or on the camp cook stove, combine chocolate, milk, liqueur. 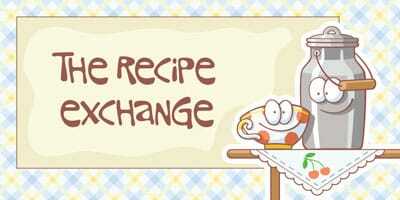 Stir frequently until the mixture is smooth. Dip fruit or other “dippers” of your choice and enjoy. For more information about Affiliate Marketers Give Back, the organization that published the cookbook, visit: www.AffiliateMarketersGiveBack.com. “It’s All About the Cookies,” can be purchased at Amazon.com.